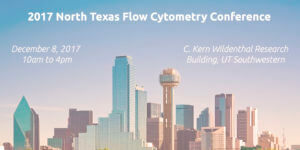 DALLAS – December 5, 2017 – The Children’s Medical Center Research Institute at UT Southwestern is hosting the second annual North Texas Flow Cytometry (NTFC) conference on December 8, 2017 with Baylor Scott & White Research Institute, UNT and UNT Health Science Center. “The mission of the NTFC conference is to promote education and technical discussion related to flow cytometry’s use in medical research. Our conference provides flow cytometry users and labs in Texas and the surrounding area a chance to network and share their best practices. We also have several leaders in the field presenting their research and scientists responsible for product development available to speak with attendees,” said Nicolas Loof, head of the Moody Foundation Flow Cytometry Facility at the CRI. Dr. Holden Maecker, director of the Human Immune Monitoring Center at Stanford University will be the keynote speaker, sharing how he developed a Global Immune Competence measurement from human blood samples using mass cytometry. Other speakers include Dr. Elena Piskounova, assistant professor at Weill Cornell Medicine; Dr. Kara Nihan, senior scientist in applications development at BD; Dr. Brian McFadden, associate professor of kinesiology, health promotion and recreation and director of The Applied Physiology Laboratory at UNT; and Dr. Yu-Chieh Wang, assistant professor of pharmaceutical sciences at UNT Health Science Center. Attendance is free, but registration is required. For more information and registration details visit the NTFC 2017 Conference website. NTFC is based in the Dallas/Fort Worth area and is conference partners with FlowTex in Houston, TX, which is an associated society of the International Society for the Advancement of Cytometry (ISAC). The goal of FlowTex and NTFC is to promote and foster research through the sharing of information and experiences in flow cytometry.